Mr Lim, Khai Ngee, 56, is the owner of this unassuming hawker stall in this food centre. I have heard a lot about his Rojak. 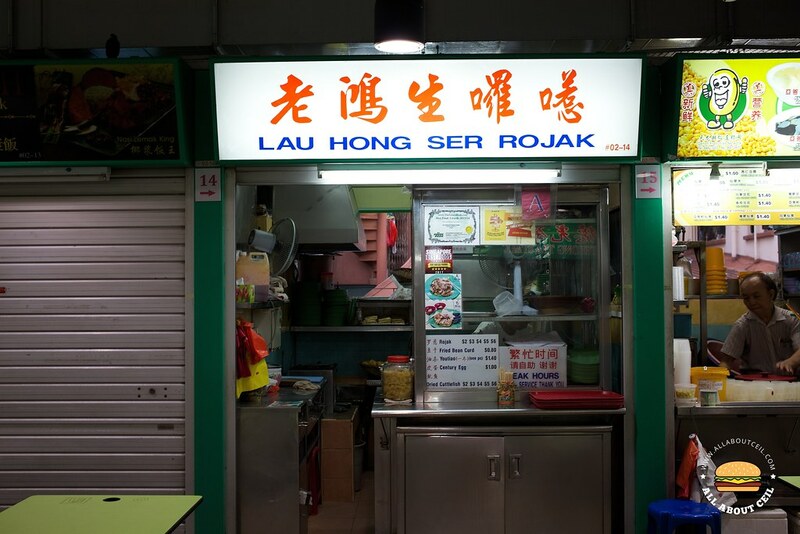 Some even said this is the best Rojak in Singapore and the waiting time could be at least an hour. Mr Lim is passionate and insists on using only the best and freshest ingredients. He still crushed and toasted the peanuts and not using those done in the factory just like most of the other stalls out there. He sources the best prawn paste from Penang and dried cuttlefish from Argentina. And, he is still making his own chilli paste. I was there near 5.00 pm and seated somewhere near the stall, waiting for the signboard to be lighted up. He started exactly at 5.00 pm and I thought I was the first customer but there was already an order ahead of me. I waited. He looked up when he spotted me and asked for my order. I decided to go with a $2.00 portion. The prices are $2, $3, $4, $5 and $6 for Rojak with an option to add Fried Bean Curd for 0.30 cents, a piece of You Tiao for $1.40 and Century Egg for $1.00. There is also the option to add Dried Cuttlefish for $2, $3, $4, $5 and $6. He asked me to come back later. I waited at the empty table right in front of his stall. I observed how he diligently toasting those You Tiao and Tua Pok over the charcoal fire right at the corner of his stall. Then, he meticulously cut it up and mixed with other ingredients like turnip, pineapple, cucumber and even bean sprouts with the prawn paste. He works on it like a masterpiece. He even insists on doing so amidst a long queue in front of his stall. He brought it over to my table when it was done and he said thank you in Hokkien when I handed him the payment. The sauce is thick and its fragrance has been further enhanced by the chunky peanut sauce. The You Tiao and Tau Pok were nicely grilled for a light crispiness with a smoky aroma. This is definitely amongst the best Rojak in Singapore. They do accept calling in to place the orders in advance which contributed to an even longer waiting time but the wait is worthwhile though. 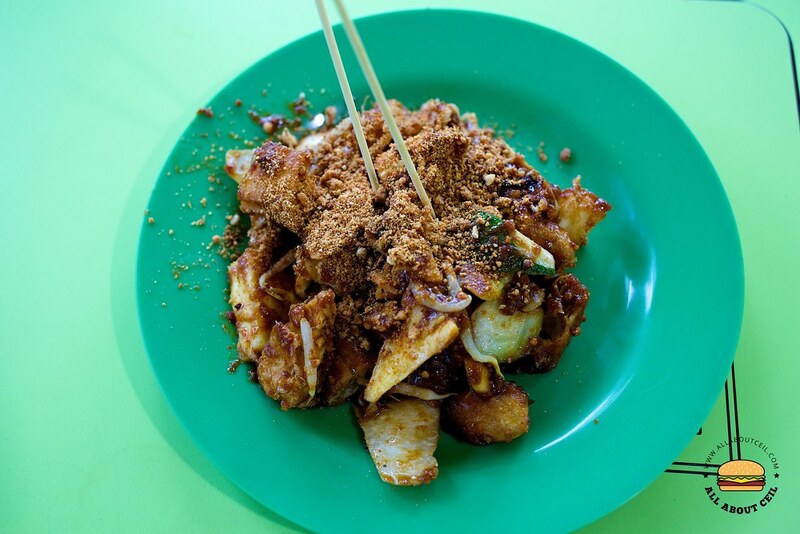 If you are staying in Ang Mo Kio, there is a noteworthy rojak at the first coffee shop of Block 347 Ang Mo Kio Avenue 3, just a stone's throw from AMK Hub and is near the Ang Mo Kio MRT. This Uncle has been there for the past 15 years. He is equally passionately in serving the best Rojak, he is also painstakingly toasting the You Tiao and Tau Pok. If you requested for an extra level of spiciness, he has a special type of extra spicy chilli paste just for it.